best recipes you'll ever eat! Yes, I know & one great cook!! Can't oder one at this time, we are having to completely redo our bathroom and there goes any extra $$$. 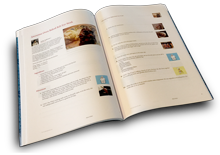 DID you know...ROSE MARY Mogan has a cookbook..
Do you want the site??? Bonnie, you're recipe looks fantastic! Have you see all of my "BEST" cookbooks..
Glad you all liked the cookbook. Thanks Theresa, Ma & Kimi! Love it...thanks for adding 2 of my recipes!! Thank you for including my recipe too! Can't wait to get my copy!